The Allan Block Stones has a 12 degree set back built into the block. 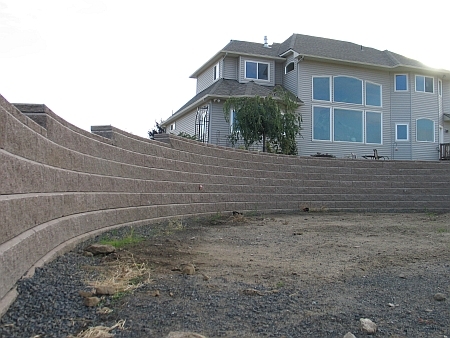 You can build taller retaining walls using less geogrid than vertical retaining walls. 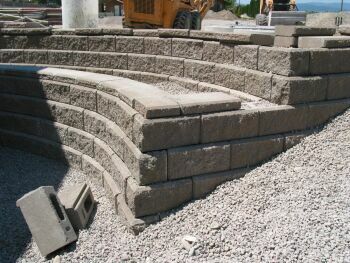 This makes th AB Stones an economical solution in taller wall situations. 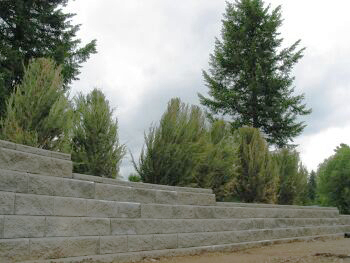 Moscow Landscaping installed the walls on this phase of the project. 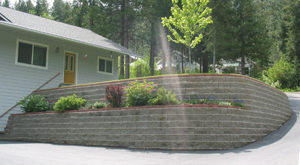 To make a more buildable lot, this homeowner created numerous retaining and landscape walls. 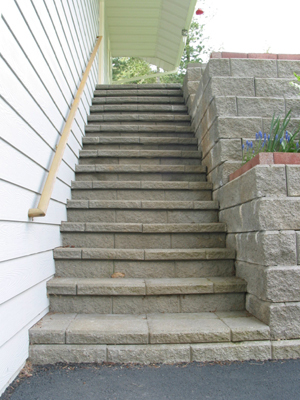 On the Stairway, he modified the cap block to overhang the face of the Allan Block. 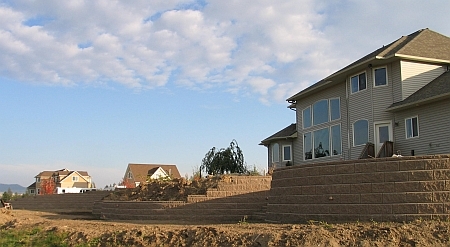 Before installing the Allan Block Stones, this landscape had a 3 to 1 slope away from the house. 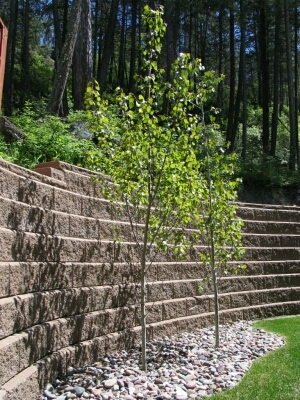 By installing the retaining wall, the owner created a more useful property. The homeowner did an excellent job of laying out the radius on the wall. 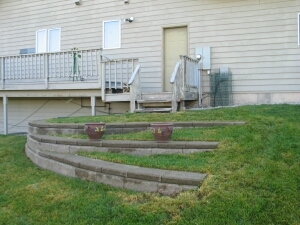 He also built in some steps to access the patio and deck. This wall is on the property line of 2 homeowners. It is the dividing line for their respective back yards. A.M. Landshaper created some very straight horizontal lines in this wall. Twin Lakes Golf Course built a new maintenace shop near the driving range and needed to retain the ground on three sides of the shop. 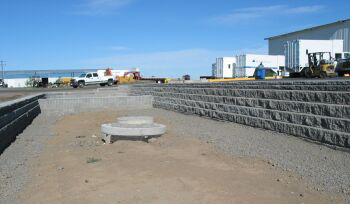 They chose the AB Stones which has the 12 degree setback to increase the stability of the walls. 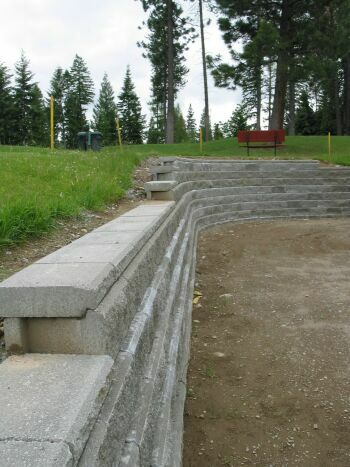 A.M. Landshaper installed the wall for the golf course. 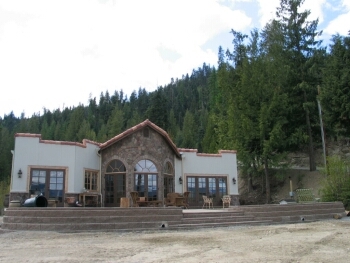 The owners wanted Buzz from WEH Enterprises to provide better access and parking at their cabin. The road coming into their place was very steep and had a big hump in it making it difficult to get to their cabin. Buzz removed the hump and regraded the road to make it easier to drive. He also leveled out a larger area at the cabin to create a better parking area. 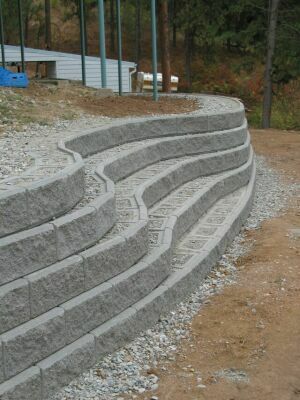 He used the AB Stones and AB Grid to hold the hill that supports the driveway to the cabin. 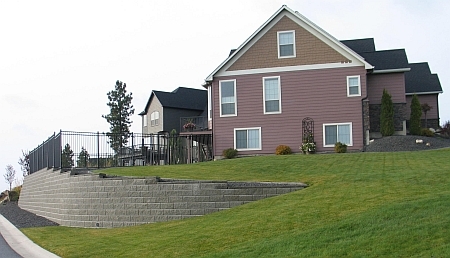 The owners also wanted more usable yard space in their backyard that overlooks the lake. Buzz used the AB Jrs to create a little more room for them. Shannon Altenberg was the foreman for this project. 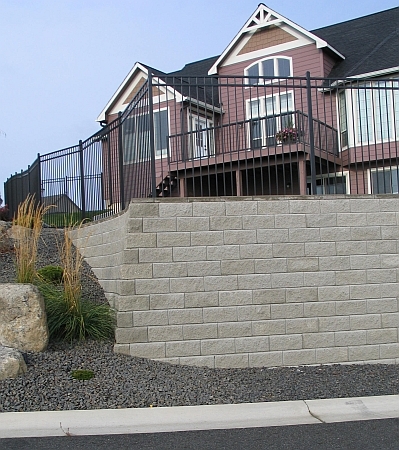 Shannon is no stranger to the Allan Block Retaining Wall System. 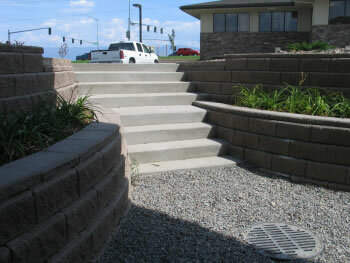 He and his dad Bruce were the 1st 2 Certified Allan Block Installers in the Kalispell area. 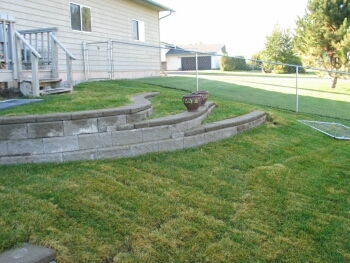 The project required cutting back the sloping bank to give the owners more back yard space. 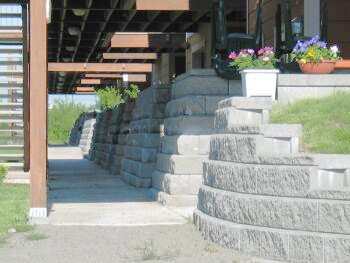 Using the Allan Block Stones in the Tan color, they built the retaining walls using geogrid to add stability to the soil behind the wall. With the creativity, knowledge and experiance that the Altenberg team has, this is one beautiful project that has exceeded the expectations of the project owners. Barrier Industries needed to enclose a 208 swale area at their industrial park. 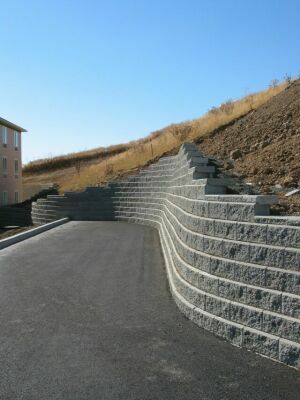 They have used the Allan Block Retaining Wall System before and have been happy with the results. 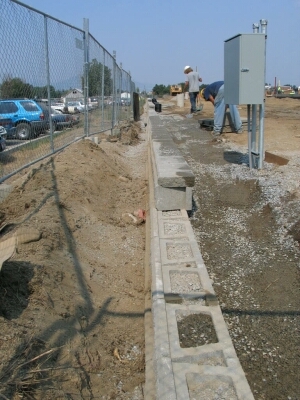 Their crew installed the block on a compacted gravel base and backfilled and compacted with gravel. They capped the wall and asphalted to the back of the cap. 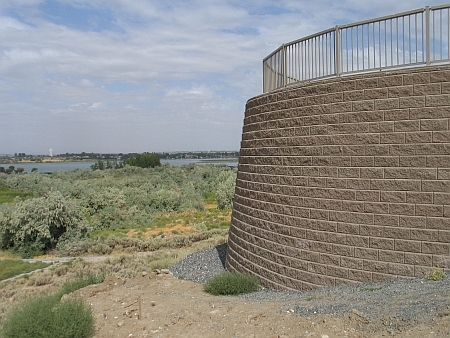 The purpose of the 208 swale area is to collect water run-off from the asphalted areas and provide a place for the water to drain. 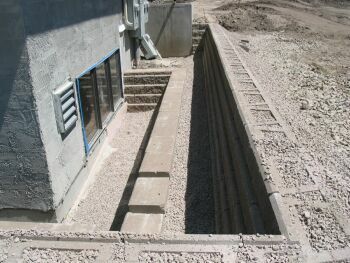 Typically a drywell is installed underground for this purpose. The project uses Tan 12* Stones. The facility needed an upgrade to the landscaping and replaced failing timber walls. More of the Marina Cay project. This project is using the 12 degree set back because of the parking lot loading that will be on the wall. 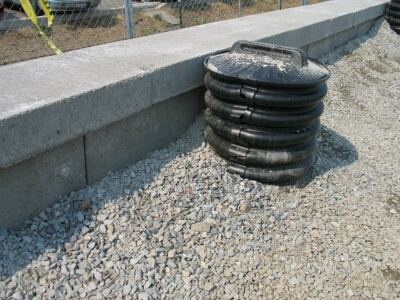 The Sleeve-It system is a new product that allows placement of the product during wall construction. 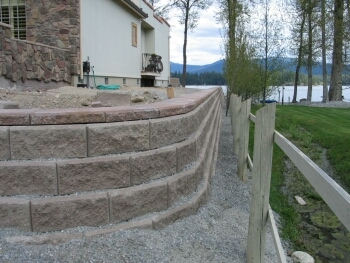 After the wall is built, the fence contractor comes in and grouts the Sleeve-It unit and sets his fence post. 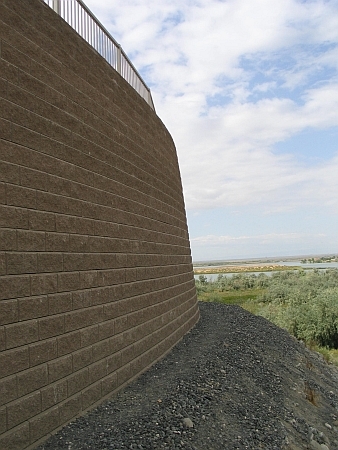 It is an engineered product that maintains the integrity of the geogrid behind the wall. 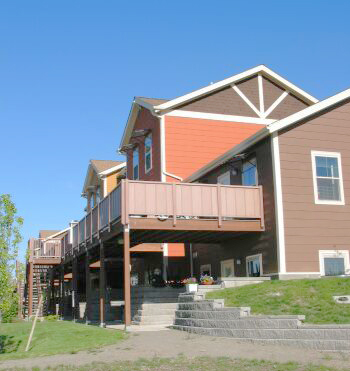 This was a challenging project of for the builder. The property owners wanted a rancher style house on the property. The site had a lot of fill material from other construction sites in the neighborhood. The builder had to remove the fill then build the wall & backfill as the wall went up. 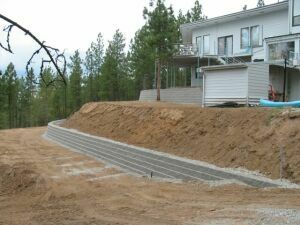 The design called for a fair amount of grid as the wall & reinforced soil provide support to the new house being built. The homeowners needed to expand their patio area. 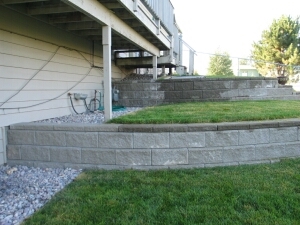 Because of the grade changes, they needed a retaining wall to build up the patio area. 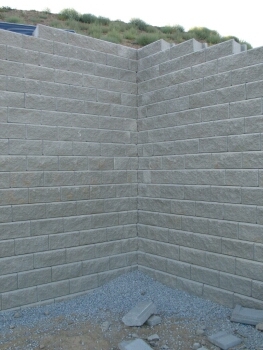 They used the Allan Block Stones 12 Degree setback to create a strong wall that can hold up the new patio. 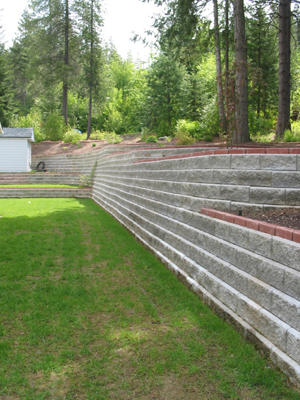 The built in stairs create a nice access way to the lawn area and the lake. 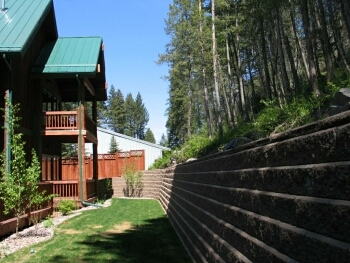 The property needed to be graded out to give the homeowners more space in their back yard. 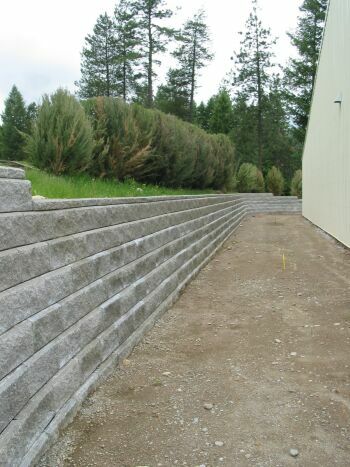 The Allan Block Stones Retaining Wall Block offered a great solution to level out the yard. Mark Johnson of Majestic Mountain Landscaping is one of Anderson's Masonry Hearth & Home's Certified Allan Block Installers. 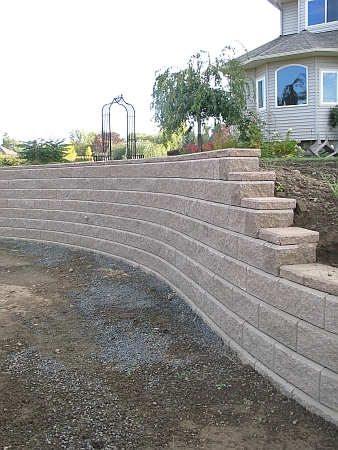 This project needed a retaining wall to carve out a flat area in the back yard to create a space for a paver patio. 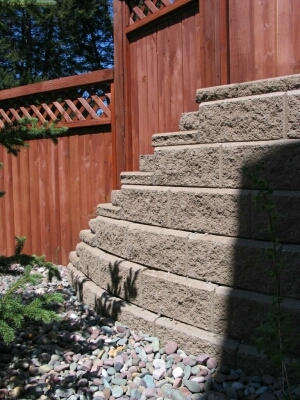 The Allan Block Stones 12 degree setback offered the best solution. 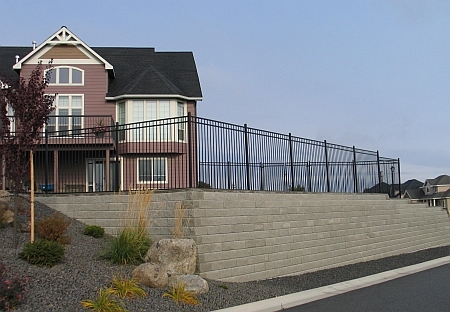 With a wall height of 6 feet, they utilized the AB 4'x50' geogrid to add more stability to the native soils behind the wall. The home owners bought and paid for the materials, but needed an Allan Block Expert to complete the project for them. 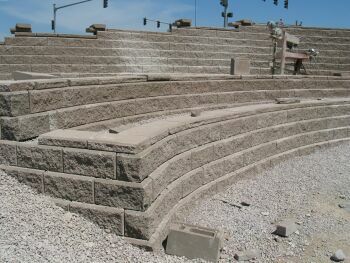 Hard Rock Stone Co. stepped in to finish the project. This project was on a very tight budget. They needed to create a "basement" at the 1st floor level to keep the constuction expenses down. 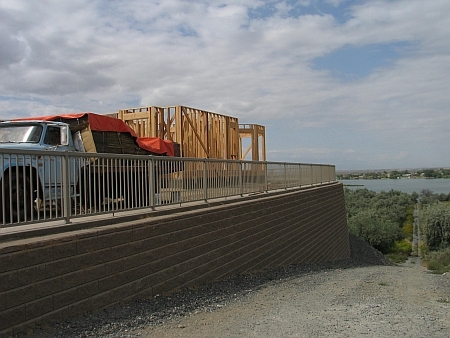 Segmental Systems was able to use the design by STI Northwest to create the site elevations needed. AB Stones were used to keep costs down, due to the ability to build up to 5-1/2 feet tall as a gravity wall. 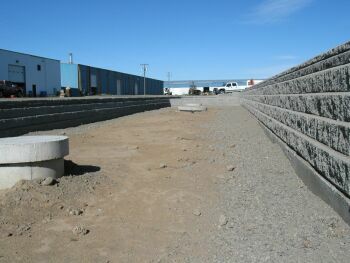 This is the second phase of wall construction on this jobsite. The first phase was finished in mid March. Since then, the footings for most of the buildings have been built and the retaining walls need to be installed before the rest of the building is framed out & completed. 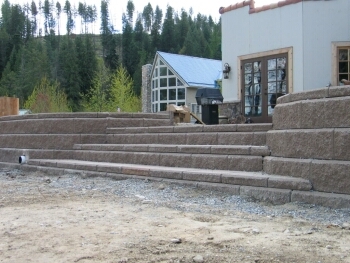 The owner and installer chose the Allan Block 12* Stones because of the built in set back. 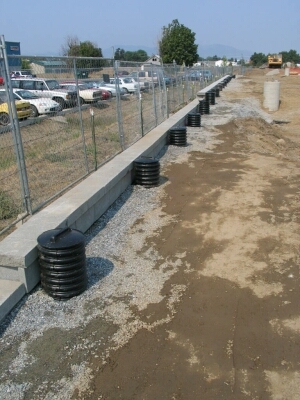 It reduced the amount of grid needed and still provided a strong structural wall to meet the site requirements. 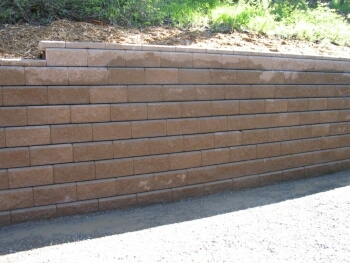 More pictures of the AB 12* Tan used on this project. 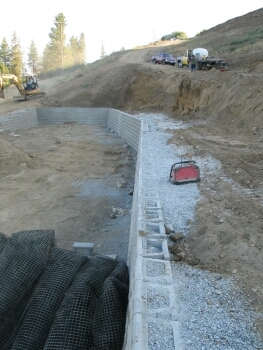 This is a large 208 Swale that was required to accomadate water run off for the proposed development. The tallest section of wall is near 13 feet. 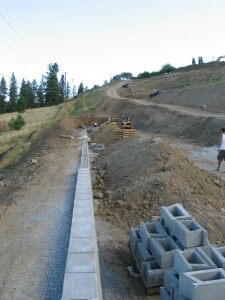 Because of the slopes, loads and wall heights, geogrid reinforcement was used throughout the wall.